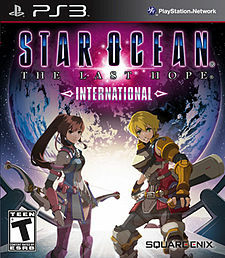 When I eventually decided to review Star Ocean: The Last Hope, I had to figure out how I was going to balance my feelings about the game. I admit that I’m a huge Star Ocean fan. 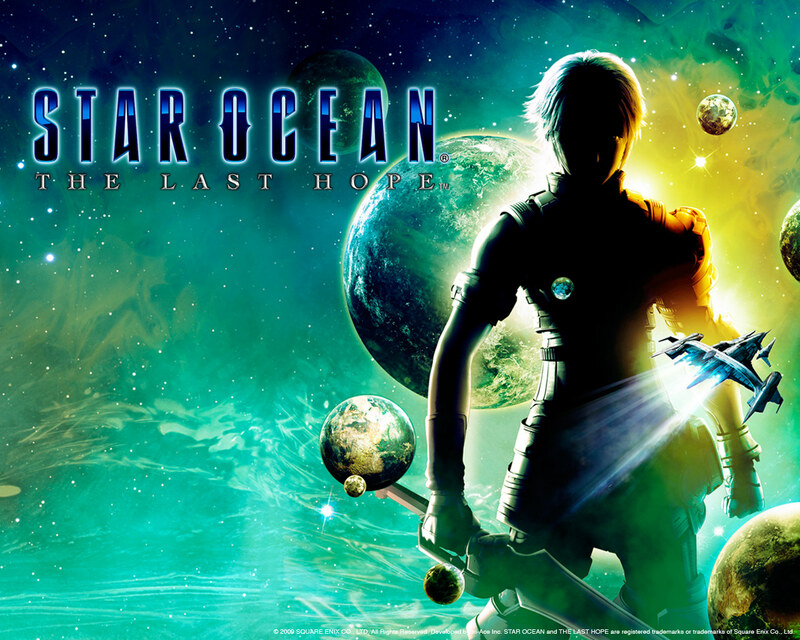 I played Star Ocean: The Second Story on PSOne many, many times over. I simply loved it: the free roaming battle system, the characters and sci-fi-meets-fantasy plotline, and oh God, the music. 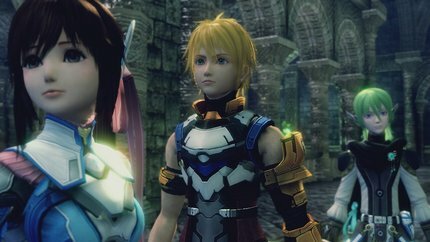 I played Star Ocean: Till the End of Time on Playstation 2, and while not as memorable as the former, I still loved it, and I even found the infamous plot-twist to be a welcomed surprise. Keeping that in mind will give anyone a sense of how I perceive the series. I decided to write this review in the same progression of my own personal reactions of the latest game. So, consider this review a sort of journey of discovery. You won’t know exactly how I feel until you read through to the end. This was literally my first game in the HD generation. I picked up Star Ocean alongside Final Fantasy XIII. I had found out that the PS3 version was a more complete version, with the optional Japanese voiceover, as well as the ability to make the menus and displays appear more “old-school.” I found these options to be a saving grace for this game, especially the option for Japanese dialogue. Yes, let me get this straight out of the bag: the English voicework for this game is absolutely hideous. Don’t get me wrong, I do enjoy dubs, especially if the voice actors catch the charm of the characters they are trying to portray. Not so here. I’m not really sure what Square Enix was thinking; in fact, I often wonder what goes on in the brains of publishers regarding dub work . A localization can mean the difference between life and death for a JRPG, or any game for that matter. Because games are completely tailored around voice acting in this age, it is a serious detriment to overlook the importance of a quality dub. Now, these are just extra features for the game. It is very easy to win me over with great characters, a good story, and a fun battle system, despite any negative qualities. How does the meat taste? To the deeper details, then. This is what I was thinking through the first…15 hours of the game. You will literally be roaming around bland dungeons for a large chunk of the game, without much of a good reason to do so. I caught myself thinking ‘No, not another generic dungeon!‘ quite a few times. During these tedious trips, I also found myself wondering why I was even playing. ‘It must get better. It must!‘ I kept prevailing. This feeling wasn’t helped by the lopsided graphical presentation. At one moment, the game would shine with brilliant details and lighting, and the next, it would be marred by inhumanly doll-like characters and hideously dull dungeons. Don’t get me started on planet Aeos, either, which is the first planet you have the privilege of landing on. Most of it is covered in a weird variety of radioactive pea-soup green and brown, populated by alien creatures that look like they were ripped straight from Starship Troopers. I kept thinking back to when I first played Till the End of Time, when I was quite impressed by how vivid and beautiful the backgrounds looked. I remember going through one of the earlier dungeons in that PS2 game, which was a map of some ruins, and rocking out to this rad electric guitar solo playing in the background. Star Ocean 4 just doesn’t quite have anything that matches that feeling. Look at my new doll collection! You could say that, at times, The Last Hope actually feels like a poor copy of Till the End of Time– except in this game, your hero has yellow hair instead of blue. The battle system is very similar, the camera viewpoint, the dungeons, and even Edge, the main character, looks like a lost brother of Fayt (main character from the former game). Even the whole idea about having special abilities because of science experiments has been recycled. Perhaps I’m being a little bit dramatic, but The Last Hope does take a very long time to build its own identity. Most of the exploration feels very tedious- yes, I’ve used that word already- and one of the reasons for this is because you can already see everything in the map. In Till the End of Time, you had to explore to find out the rest of the map. There also was this little extra incentive, where you could explore and 100% each map and get a prize. Unfortunately, Tri-Ace didn’t feel that was necessary for The Last Hope. And unfortunately, most of the dungeons become tedious ‘point a to point b‘ affairs, and don’t lend themselves to exploration. I already mentioned that most of them are very dull, so that is a double whammy. Missing Prodecure. Missing Procedure? Missing Procedure! In the first leg of the game, you come to find out that Earth has been practically destroyed by the aftermath of World War III. Our beloved planet is hardly able to sustain life anymore, so Earthlings have launched an incredible space mission to discover the four corners of the universe and find a new one to survive on. Eventually you will come to know of a special galactic goo that is threatening the very existence of life itself. I won’t spoil too many details here, but expect to hear the phrase ‘Missing Procedure’ many, many times. Just know that the storyline ends up with some kind of conflict, yes, a conflict, with an antagonist that wants to destroy things for a particular reason- how unique! You start with Edge Maverick (seriously, who chose this name? ), the main protagonist, and Reimi, his childhood female friend. The game begins somewhat similarly to Till the End of Time, where you are introduced to a battle simulator to learn the battle system. 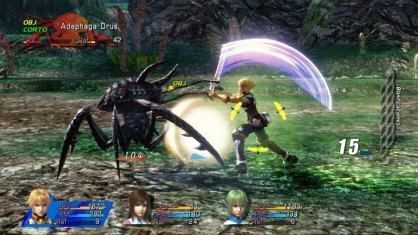 Even if you are familiar with other Star Ocean games, prepare to spend at least an hour coming to grips with this battle system in the simulator. For me, certain features still didn’t click until hours later. The battle system may not be the quickest to learn, but once you get it, it feels good. No, you read that right. The battle system is definitely one of the positives of this game. Yes, it does take a while to learn it, and yes, it doesn’t quite blossom into a fun and deep system until later in the game- but it is worth the wait to get to that point. Eventually you will have a large roster of characters, and you will be able to switch any of the characters if you like. One nifty feature of the battle system that I didn’t know about until later in the game, is the fact that you can switch out characters mid-battle. This is a great and more JRPGs should have it. Go back to Starship Troopers, you crazy bug. Not only is the battle system fun once you start learning special abilities, but there are a number of features that keep it interesting. Instead of just simply accruing a set amount of experience and money after every battle, you have the chance of increasing those numbers exponentially if you continue to link successful battles without sustaining a critical hit from enemies. If you kill an enemy with a critical hit or special ability, you will rack up different bonus chains that increase your experience, money, and regeneration at the end of the battle. Add that with the new Blindside Technique (quick maneuver to the rear and strike for a stun), and the Rush Gauge (go berserk after sustaining a certain number of hits), and you have quite a compelling system.